I’m going to do it!!!!!!!!!!!!!!!!!!!!!!!!!!!!!!!! Cool!I have told SOOOOOOO many friends about your website! Oh my gosh, tell your Aunt Susan to post something on here! She is a GENIUS!!!!!!!!!!!!!!!!!!!!! Please tell her she is the best RL designer ever. That is so cute and adorable! 🙂 Can you tell me where you got the sparkly rubber bands? I got the Shimmer ‘N Sparkle kit so they didn’t give it to me. I think that it is a large crochet,Julia!!!! Hi! What size crochet hook are you using? Thank you! What do you mean when you say “straight” bands? I’m completely confused. Julia, when she says straight bands she means you don’t have to twist the rubber band. 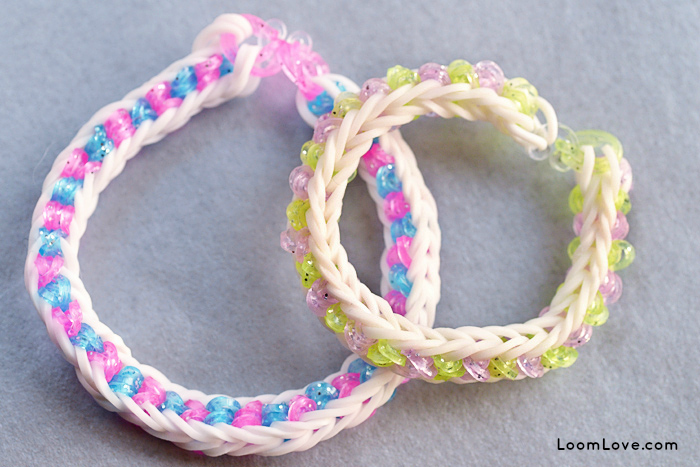 You do a GREAT job demonstrating how to make the bracelets!!! Keep up the GREAT job and I look forward to new creations! Thank you Thank you! OMG! 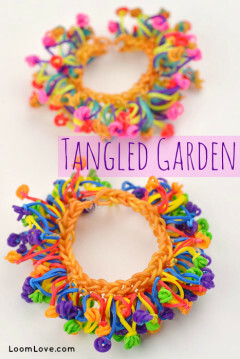 I am totally going to make one as soon as I get the glitter bands! Neat! How did it turn out Mari? Post a pic on our Facebook page. WOW! that is so cool your aunt is amazing! It’s pretty easy but it’s very repetitive. I have the Wonder Loom from Walmart. 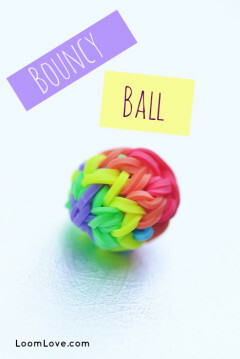 When I tried this I just used the end that has the two pegs in a line and one slightly up. I used the end two pegs and ignored the rest of the loom. I don’t think so! It’s YOUR bracelet. You can do whatever you want with it!! You should post a video of how to make it! I really like the bracelet design! The video is good and I think I have followed the directions. In some spots, my center bands are sticking out and look kind of bumpy. Did this happen to anyone else? Any ideas on what I am doing wrong or what I can do to get it to look nice and smooth like the picture and video? Thank you! This design rocks great job!!! omg, I LOVE this bracelet!!! Super cute! I like this pattern a lot, but how do you stop the back from looking like a lumpy sea monster’s back? I ended up having to loop mine 4times, the three came out too messy. I made this for a special needs girl who I sometimes babysit. She loves it! 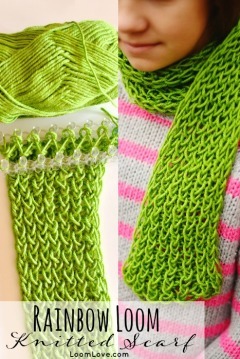 What can u do with the loom weaving tool u can get off Gv Bargains? 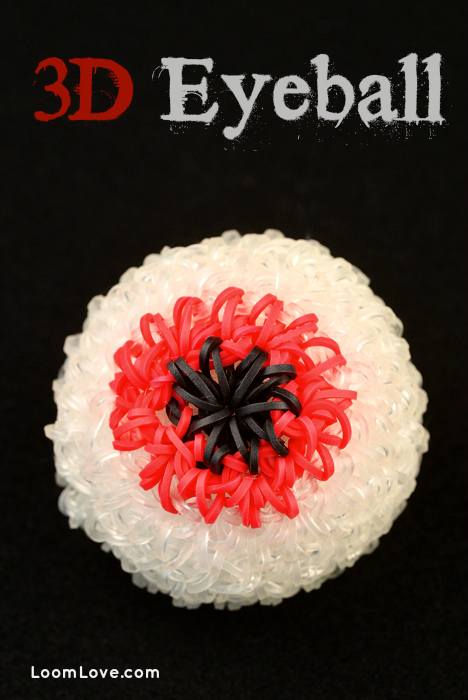 Thanks so much, I made this and My Family thought they were REAL BEADS xDD. OMG so cool but i can want youtube our internet costs money please do a picture tut!!!! Hey you are the best at these tutorials please could you try and come up with something to do for an engagement party I am going to one on Saturday and I didn’t know why to buy the couple so I thought a rl bracelet keep up the good work?????? took ages to complete but once it was finished it looked AWESOME! thank u sooo much i look forward to any new ones you’ll be doing !! Wow this is an awesome bracelet. I really thought they were beads at first!???????????? Why do smiley faces end up as question marks? 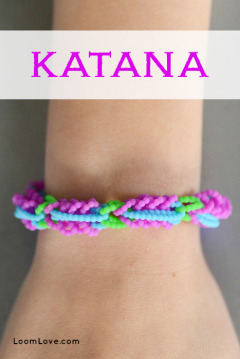 I love this super easy bracelet! You can make it on your fingers too! 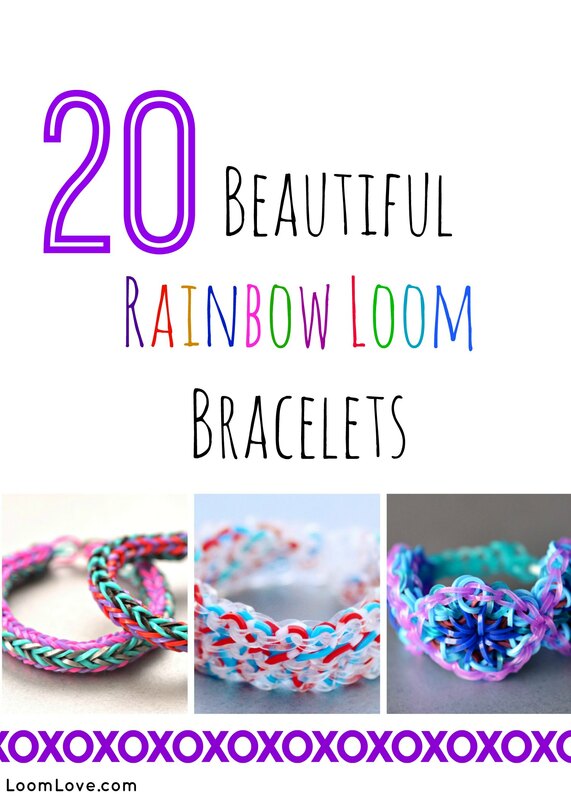 Just use two fingers as the looms pegs! You still can use your fingers to make the thigs to put on your fingers! (Hope you understand what I just said!????) ???? What, those weren’t question marks?! They were a space and this: ????. No, a wonky smiley face from imoticons!!!!! Why do you have to take out the middle peg can you just do it on the side pegs???? 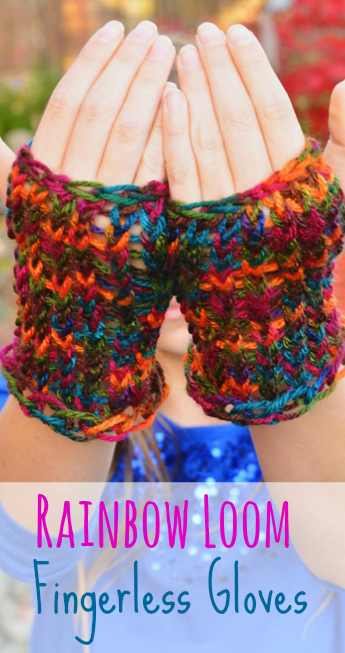 Can we not use a crochet? Because I don’t habe one and it’s hard to find a crochet. 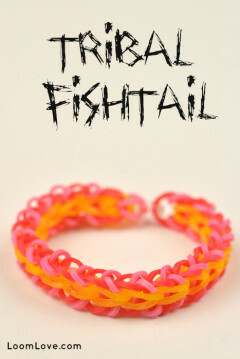 Anyways, going to try this and awesome bracelet! Love all your works and this is the only website I really love! 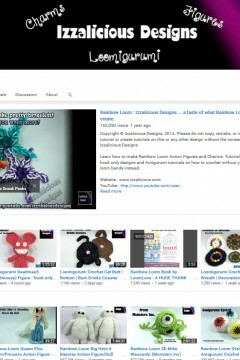 <3 best tutorial website of RLs ever! Ha! At first I read the have part, and I was like what!!!??? Then I was like ohhh. It looks like beads made one for friends and loved it. I have found you web page on Facebook . im trying to make but its sad to say i can’t,but i will try n try until i make it…. I am going to try this out it looks amazing. ????? Love this idea I’m so trying it out????? I have been searching and searching for instructions on how to make a new style of Loom, I have only ever done the easy one! I am looking for a new,cool style that I can do that doesn’t use the pegthing! Please help! I love this this is awesome! i am making it now that is cool do you have more things that you can show me right now nice work woo! woo! woo! Can’t you just use your fingers for this one?? because some of us don’t have where you can take one row of pegs off. But anyway this is my favourite design of all time and your aunt is amazing!! thank you soo much!! Oh My God.. So Cool!! Are those beads? – Or bands? Or is it… AN ILLUSION!!! it kind of hard when the first time but i understand the last, thanks it really help :D! I invented this before the video was posted. But it’s okay, it’s an amazing design! Are those beads? Or bands? totalllllyyy awesome 😀 i made this 4 my newborn niece it turned out SICK!!! I ? 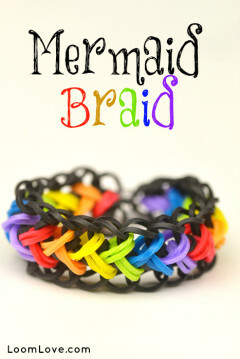 this bracelet I have made it and it is easier than it looks so I think this bracelet is AWESOME!!! Cool!! But it’s sad that i don’t have any of the glitter bands.. Will it look the same if i use normal bands instead of the glitter bands?? Me and my sister worked out how you can make this bracelet on a hook, we’ve noticed that when we made this rabbit by elegantfashion360. This technique was used for the ears. 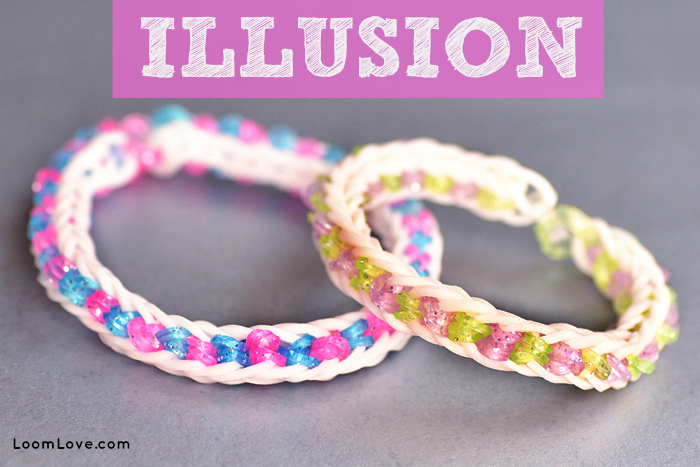 Well it almost does because however your illusion bracelet looks more fishtail on the sides. I just made one with pink,purple and blue.it looks awesome! !I have made about 25 and I am going to sell them!! Wow! 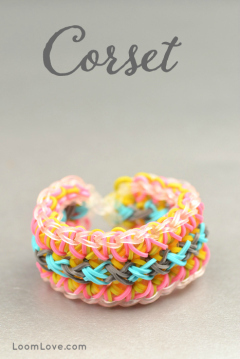 i love this awesome, cool bracelet! it looks like the sparkly bands are beads. 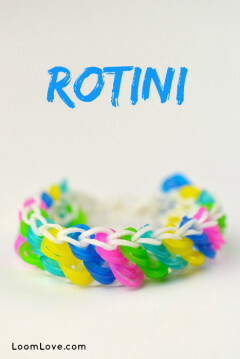 This is a very nice bracelet and it is EXTREMELY easy. I like mine with blue and pink (my favorite colours) glitter bands with a white border. 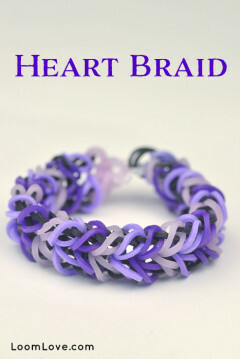 Can you post more challenging bracelets where you actually use the WHOLE loom to make it? Thank you. I really like you guy’s site. You are always my first resort! 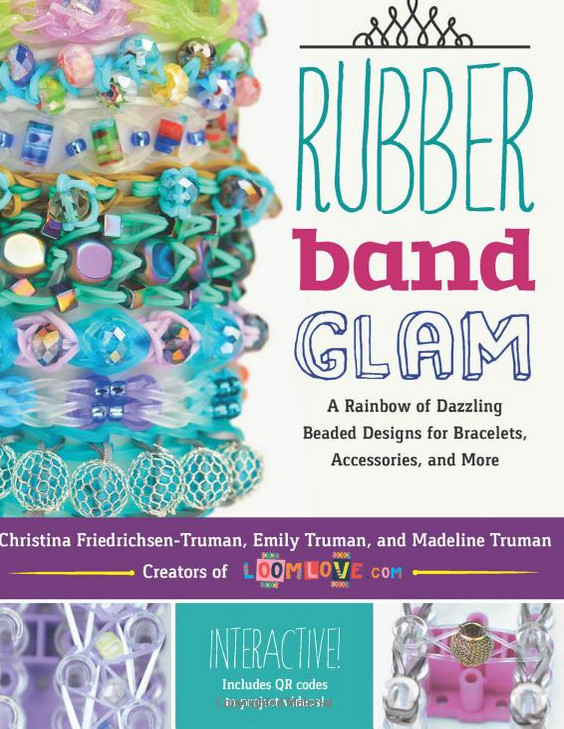 I have been Rainbow Looming since age 8 ( second grade), and I am 11 (and in fifth grade). This is my hobby. Each Christmas I ask for new bands, and I get new bands. The other day I successfully made the kaleidoscope bracelet and I love the result. So thank you, and keep doing what you’re doing. P.S How old are Maddie and Emily? Oh and it’s 10:40 pm here in California not 2:40 am.